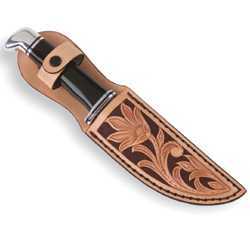 This leather knife sheath kit allows you to keep your knife safe and handy on your belt. Kit includes: pre-punched leather parts with pre-attached snaps, thread, needle, hardware, instructions and patterns for stamping/carving if desired. Will require a rivet setter and leather adhesive (not included). Knife not included. Available in 2 sizes. Small for knives with a blade up to 5" long No. 374105. Large for knives with blade up to 7" long No. 374123.